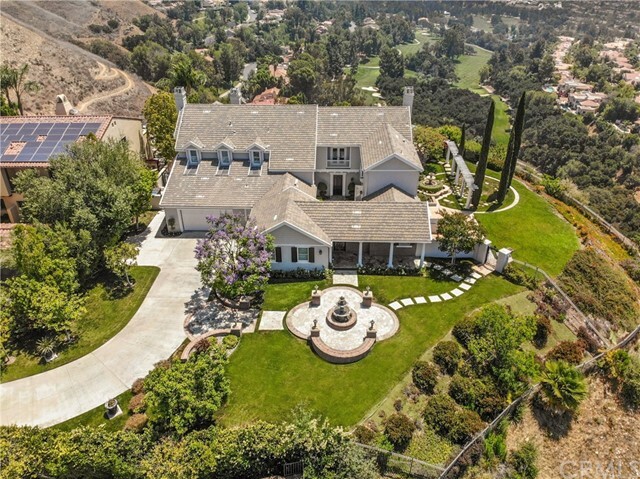 All Calabasas homes currently listed for sale in Calabasas as of 04/19/2019 are shown below. You can change the search criteria at any time by pressing the 'Change Search' button below. If you have any questions or you would like more information about any Calabasas homes for sale or other Calabasas real estate, please contact us and one of our knowledgeable Calabasas REALTORS® would be pleased to assist you. "Incredible private, gated compound on nearly five acres, minutes from beautiful Malibu beaches. Completely renovated inspired by Santa Barbara architecture, enjoy complete privacy and park like grounds of this unique, awe inspiring estate. The main house is approximately 9,659 square feet and includes every amenity and will impress the most discriminating client. Carved limestone mantels and old world custom tile grace five fireplaces. Features include hand hewn walnut floors, alder wood beam ceilings and custom chandeliers. Extra amenities include a guard house, home theater, game room, wine cellar, two-story library, outdoor living room with kitchen, and barbecue. Two large guest houses and a separate meditation teahouse and full gym. A total of five bedrooms and eight bathrooms. A resort style mosaic pool and spa, limestone patios, Koi pond, waterfall, vineyard, and organic gardens. Breathtaking views and minutes from incredible shops and restaurants of Calabasas and Malibu." "Avalon Ranch is set in a world all on its own. Secluded beyond the guard gates of Calabasas Park Estates, this immaculate private compound consists of a spectacular approx 7,500 sf main home w/ adjoining apartment, 2-bedroom hilltop guest house, & fully equipped equestrian facility; each sited to command sweeping views of the picturesque property & the Santa Monica mountains. Amenities include: 16 stall barn with tack room; day barn with turnout; jumping arena; a 1 acre pasture; a ranch office, storage barn, and ranch-hand quarters. The grounds feature a tennis court with viewing pavilion, pool and spa, pool pavilion with fireplace, fruit orchard, majestic Oak trees, seasonal stream and direct access to riding trails. Avalon Ranch offers an incomparable canvas of nature's beauty & a rare opportunity to experience luxurious estate living in a blissfully secluded equestrian setting." "Priced to sell NOW! A uniquely realized showstopper view estate located in the posh & super secure double gated community of The Estates at The Oaks in Calabasas. Home to celebrities and the ultra rich, this spectacular mansion is truly astonishing in design and finishes with almost 15,000 sq feet of living space and nearly 3000 square feet of courtyards, patios and verandas on nearly an acre of manicured grounds. No expense spared in design, construction & finishes. Breathtaking panoramic views are the norm. Incredible volume and vast scale with soaring ceilings, massive custom stone fireplaces, marble slab floors, Swarovski crystal chandeliers, and countless other stunning features. 8 bedrooms, including a magnificent master suite, 12 baths, charming library, huge formal dining room, gym, and much more. A one of a kind mosaic infinity edged pool, spa and outdoor cooking and dining areas areas make this the ultimate combination of family home and a quintessential entertainment estate." "This stunning six bed, nine bath estate of luxurious sophistication sits in the ultra exclusive double gated Estates of the Oaks, Calabasas. The home welcomes you with high ceilings, an entrance opening to a grand spiral staircase, and custom glass windows for perfectly composed panoramic views. A chef's kitchen boasts excellence in manicured details from the custom cabinetry to waterfall slabs, opening to the main living room, bathed in natural lighting. On the second floor, four bedrooms including a royally generous master, complete with stand alone soaking tub, studio size walk in closet, and balcony overlooking the nearly 1 acre grounds. The thoughtfully finished home is perfect for family living or large hosting's alike, with a 14 seated tiered indoor theater and a substantial guest house with bath and kitchenette. The backyard is nothing short of magnificent, featuring a pool, spa, outdoor kitchenette, cabana, fireplace, and seating area, all atop the invigorating rolling lawns." "A Tuscan-Mediterranean masterpiece designed by architect Janev Valentine and located behind the second gate in the ultra-exclusive Estates at the Oaks. Custom built in 2009 with only the highest quality finishes, wood beam ceilings, and stone accents including wood and stone floors. This estate boasts single story living with only one bedroom suite and bonus room suite on the second level. Additional highlights are a home theater, wine cellar, sauna, library, office, bonus room, formal living room, formal dining room and a great room that opens up to a chef's kitchen with double island and La Conrnue range. The great room features sliding pocket doors for natural indoor-outdoor living. Enjoy the entertainer's terrace with fireplace, large outdoor kitchen and detached guest room/pool house. Outdoor living showcases a beautiful pool, fountains, gardens, manicured lawns and unobstructed views. There is a 4 car garage and motor court that could fit an additional 10 cars. Fro the ultimate in privacy and luxury living, you'll want to see this truly special property." "R-A-R-E opportunity to own or lease a home in the tranquil Estates of Calabasas. The Estates offers unrivaled privacy, exclusivity, access to trails, state-of-the-art gym, tennis courts, & security. This grand 5 bed, 6 bath custom built home, features a gourmet kitchen with Viking appliances, a formal living & dining room, master suite with dual-master closets, en suite bathroom, over-sized tub, large separate shower, fireplace & balcony. The first floor junior master suite features an en suite bathroom, walk in closet, and separate entrance. The sprawling entertainers yard features a lagoon style pool with slide and spa, BBQ, sport court, and large outdoor confidential patio with fireplace. Additional features include an office, two flexible bonus rooms, laundry room & two 2-car garages, making this the ultimate lease or purchase." "The pinnacle of luxury and grand splendor, the 10 acre view lot is located in the privacy behind the gates of a 7 home community. Timeless charm spans the over 9,000 SqFt, 7 bed, 11 bath Tuscan Estate. Inside, 12 foot ceilings and oversized glass doors illuminate the wood floors, limestone, and custom carved fireplaces in complete natural lighting. Throughout, a formal dining room, luxurious kitchen, media room, library, sun room, and beautiful subterranean wine cellar fill the house w/ an entertainers dream. Upstairs, a luxury master suite with fpl, duel bathrooms, and a stunning french door opening to a balcony view of the majestic Santa Monica mountain range. 4 additional bdrms sit upstairs, and a generous guest suite & maid's quarters located downstairs. The 360 degree royal like grounds combined w/ custom details at every turn, this home exudes elegance and panache. Completed with the superbly manicured lawn, a 75' salt water pool, and a guest house, this Estate is one of a kind!" "FULLY FURNISHED! $100,000 REMODEL CREDIT! Welcome to the extraordinary luxury compound that is 23920 Linden Terrace. Located behind the guarded gates of the coveted Mountain Park Estates, sits this exquisitely crafted Modern Spanish estate. Sprawling over 11,676 sq. ft on a lushly landscaped private 1.3 acre lot. This handcrafted custom built 6 bedroom, 10 bath oasis was crafted from the worlds finest materials. The over sized limestone and slate floors guide you through curved hallways to discover the many wonders that this home has to offer. Featuring a open formal living room, 30 ft ceilings, formal dining room, family room, media room, gym, a massive chefs kitchen and a stunning private den. Six wood burning fireplaces that only add to the beautiful ambiance of this exquisite retreat. The seamless indoor/outdoor flow commands your attention to the beautifully landscaped grounds. The spa like pool and tennis court create the perfect environment for entertaining family and friends." "An entertainer's dream with stunning views in the cool air of Malibu Canyon. This private and gated enchanting custom estate features 5 bedrooms and 6 baths in the main house and 1 bedroom, 1 bath in the detached guest house. Rural and private yet minutes to the beaches of Malibu or The Commons in Calabasas. Steven Handelmen Light fixtures, Conklin's hand hewn antique barn beams throughout, 1000 bottle wine room, theatre, gym and a saline pool make this a winner. Located mid Malibu Canyon in the highly coveted bucolic area called Monte Nido, with its fourth of July Parade and Picnic and Annual Fall Square Dance.. Access the hiking trails out your lower gate that will take you to the famous backbone trail. Aside from an amazing vegetable garden, grapes, olives and berries of all kinds can be grown there. Plums, cherries and apples thrive in the area due to the cool evening temperatures! 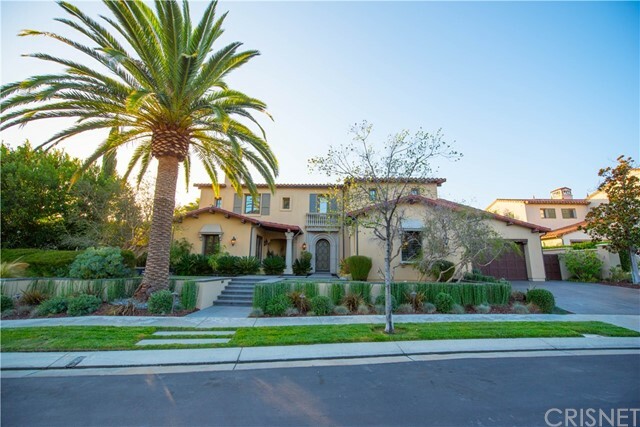 The property is located within the outstanding Las Virgenes School District and is in close proximity to private schools such as The Muse School, and The Viewpoint Academy. First time on the market and so many features. No expense was spared in creating this one of kind home. It is truly for the most discerning of buyers. This is NOT the typical Calabasas offering! It is outstanding in location, design, amenities, and the building materials selected. A propane generator is activated automatically with any power outage. Request a viewing today, you will be over the moon." "The Farms at Malibu Valley welcomes you to the latest Calabasas Private Luxury Gated Community situated on over 70 acres of lush landscape. This exclusive luxury collection is also individually gated & feature a combination of paramount craftsmanship & quality brought together in a private gated enclave with equestrian amenities minutes to both the Malibu shore & the heart of Calabasas. The Italianate is an impeccable personification of striking quality and brilliance. Over 7,000 square feet of meticulous beauty & gravitating opulence in a true custom home setting. An impressive entry complimented with Vintage Cast Stone & Bevolo gas lanterns. The Garrison French Connection Hardwood flooring and marble accents are timeless & warm. The grand kitchen features custom design with exquisite finishings. The White Carrara Marble Slabs are a perfect modern splash complimented by unsurpassed selections of Gaggenau built in appliances & a dual La Cornue Fe Range. Highlighting six large bedroom suites with private baths, private office or movie theater, indoor/outdoor fireplace and villa setting terraces. The accomplished Master Suite is impressively scaled & opens to a panoramic scene across the Santa Monica Conservancy. The magnificent Master Spa is glorified with heated floors, White Carrara Marble, Jeffrey Court and AZT Bianco custom finishes. Situated on nearly 1.5 acres of private grounds, this private estate delicately brings the latest in luxury, privacy and artistry together." "Spectacular secluded Equestrian Estate in the exclusive Malibu/Calabasas hills. Newly remodeled designer's mid-century modern ranch house. Open floor plan w/high beamed ceilings, clerestory windows, beautiful teak built-ins, exquisite imported stone tops, chef's kitchen & butler's pantry. Master suite opens to a very private pool & spa retreat area. Master bath features a spa tub, steam shower & 2 walk-in closets. Watch your horses grazing or training from inside the house or while relaxing on the expansive, wisteria lined covered patio. Featuring apx 5+ acres, 10 stall breezeway barn, wash racks, tack room, large pasture, round pen, 2 covered corrals, a riding/jumping arena, 2 paddocks w/perimeter conditioning track or convert back to full dressage court. Stunning Santa Monica Mountain views. Natural landscape, riding trails & long private gated driveway. Access to miles of trails. Very special opportunity to own a Dressage Olympian's former training facility." "Exquisite Ultra-Private Tuscan Villa on one-of-a-kind acre lot within the exclusive gated community, 'The Oaks' of Calabasas. This magnificent estate offers 5 bedrooms, 6 baths, separate entrance guest quarters/casita, gym/office, intricately carved built-ins, granite accenting, Mar Siena travertine, surround sound system, and custom lighting. Artisan quality finishes are highlighted by dramatic high ceilings, providing a sense of unmatched scale and volume. The grand entrance foyer leads to the den/library, one of two staircases, spacious master suite with sitting area, a royal junior suite plus two additional en-suite bedrooms, expansive great room, and an open gourmet kitchen looking out to private mountain views. The rear grounds are lush with breathtaking landscaped gardens, multiple fire-pits, a large barbeque area, putting green, sports court and dramatic cabana overlooking the tranquil pool and spa." "Brand new 2.5 Million dollar remodel, one of the few completely redone homes in Calabasas. Pictures DO NOT do this custom home justice! Must see! The entirety of this estate has been refinished to perfection with modern day contemporary stylings, exquisitely crafted with high design enriched to excellence. Over 10,000 sq ft of luxury & set back on it s own privately gated driveway into a large circular motor court. The custom double door entry into this Villa welcomes into bright family and living spaces luxury adorned. The perfect balance of stately traditional with a contemporary villa, the features expand white marble flooring, 7 large ensuites with private retreats. The Master Suite is stately & expansive with two large walk in closets & two individual his & hers full baths, reimagined ground up to every detail and finish. A private movie theater perfectly tailored; The grand kitchen features marble counters, brand new stainless steel appliances & custom built ins. The exquisite formal dining room features a custom built refrigerated wine cellar. The grounds compliment a resort living with beautiful new hardscape, built in bar with television, custom water features & contemporary fire pit seating, a broad barbecue serving bar with beautiful finishes. There is a fully permitted private guest house with brand new appliances, perfect for extended family. A unique luxury estate on over half an acre of mostly flat grounds finished with brand new lush landscaping. Must see!" "Located within the exclusive guard gated Vista Point. This one of a kind architectural showplace sits atop a unique cul-de-sac estate offering unparalleled views of both rolling hills to city lights. The unique estate is truly a custom home for a super star lifestyle. The retractable roof covers indoor cascading waterfalls amongst a jungle-like indoor atrium, living area Koi pond and stone spa for an eastern zen aesthetic. The three level home features walnut and Travertine floors, stone counters, copper doors, detailed soaring ceilings, full gym and a 13 car garage converted into a state of the art recording studio bringing a multi use bonus area of substantial size. The backyard has a custom piano shaped pool with spa and built in outdoor BBQ perfect for entertaining and relaxing alike. The beautiful 6 bedroom 8 bath home is a rare landmark and a sight to see." "Magnificent VIEWS! Rare Reserve Plan 2 Estate located within the exclusive guard gated Oaks of Calabasas. Meticulously designed and upgraded with the finest quality custom finishes, this stunning estate features 6,270 sq ft. of exquisite attention to detail like hand finished stone floors and spectacular RH crystal light fixtures. Featuring 6 bedrooms & 6.5 bathrooms including master suite with beautiful views, additional retreat area w/cozy fireplace, huge bathroom w/separate shower and generous walk-in-closet. Artisan quality details are highlighted by dramatic high ceilings in the formal living room, grand foyer, and richly wood paneled library. A state-of-the-art chef's kitchen offers a large center island with breakfast bar, stainless steel appliances & granite counters. 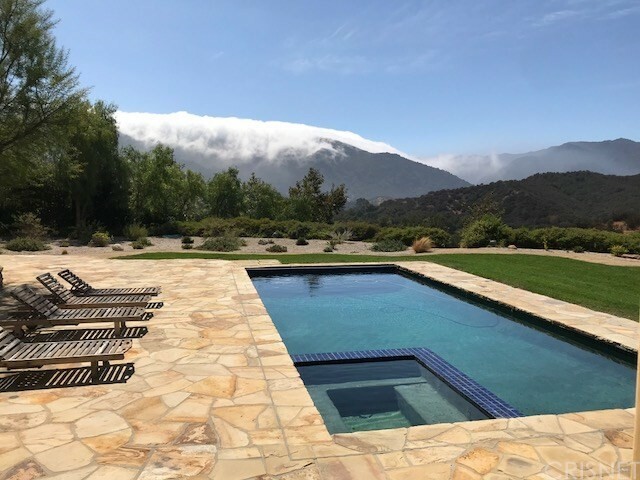 The rear grounds provide for an infinity pool, spa, dramatic fire pits, outdoor shower, prep island/kitchenette with Viking appliances, and several seating enclaves all showcasing panoramic mountain and city views"
"The Oaks of Calabasas. Nestled on a quiet cul-de-sac, this absolutely model sharp, and rarely available Lang Luxury Homes Castille Plan 2 offers panoramic mountain and sunset views. The sunny open floor plan boasts over 6,800 square feet of luxury living space. Beautifully upgraded throughout, highlights include a gorgeous center island chef s kitchen with stainless steel appliances, butler s pantry, and sunny breakfast room, opening to the spacious family room with fireplace, plus a dedicated home theater, large bonus room with custom built-in desks & cabinets, office, and six, en suite bedrooms including the luxurious master suite with view balcony, gorgeous, completely remodeled bath with free standing tub & large walk-in shower, and oversize custom closets. Additional amenities include wood & stone floors, all upgraded baths with heated floors, decorator lighting fixtures, custom window treatments, French doors, and a backup generator. The manicured grounds include a welcoming, front water feature with fountains, large covered patio, complete barbecue center, entertaining areas with two fire pits, grassy lawns, and a dramatic, zero edge infinity, salt water pool & oversize spa with unique, sculptural water feature and kids basketball area." "Guard gated Mountain View Estates. This beautiful, custom built Mediterranean Estate offers pastoral & sunset views and is located at the end of a quiet cul-de-sac. Featuring approximately 10,000 square feet of elegance, amenities include a custom home theater, center island kitchen with an adjoining, sunny breakfast room, large formal dining, spacious family room, living room with volume ceiling, bonus room, game room, and gym with steam shower. There are five en suite bedrooms including the luxurious master suite with private office, large view balcony, coffered ceiling and all stone bath with a spa tub nestled in a large picture window capturing the sunset views. The lush private grounds include an infinity pool & spa with water feature, mature landscaping, and garages for 4-cars. Additional amenities include wood & stone floors, big picture windows, three fireplaces, and artistic, wrought iron staircase." "Experience the ultimate Southern California Lifestyle with this stunning, single story in coveted Abercrombie Ranch Estates. Updated throughout with contemporary designer finishes, this light, open concept floor plan offers sophisticated yet comfortable style of living blending the indoors with the nearly 11 acres of private paradise outside for daily enjoyment or entertaining on a grand scale. Amenities include stone and wood flooring, dramatic vaulted ceilings, stately stone fireplaces, and oversized French Doors leading to the amazing back yard retreat. The gourmet kitchen boasts top of the line,Viking appliances, custom decorative backsplash, trendy white quartz counters, huge center island and butler s pantry, complete w/ walk-in wine cellar. Additional highlights include a 12 seat-state of the art theater, and a luxurious master suite, complete with separate baths, generous closets and adjacent gym. Outside you will find a re-done backyard oasis featuring a separate guest Casita, sparkling pool/spa with Baja shelf and glass tiles, BBQ area, sports court, gas fire pit, skateboarding ramp, mega slide, and the entire hillside replanted with drip systems, pathing with lights and benches and a stunning overlook at top of hill for spectacular sunset views of the Santa Monica Mountains. Recently added Solar system makes for much lower Electric bills. Truly a home to be treasured for years to come!" "Panoramic city lights views highlight this beautifully upgraded home, sited on a premium, top of the development street in The Oaks. Highlights include a gorgeous, completely redesigned kitchen with new custom cabinetry, La Cornue range and all new appliances, a superb home movie theater with all quality components, a redesigned master suite with retreat, master bath with expanded walk-in shower, special vanities, and remodeled wardrobe closet, plus a wonderful, second upstairs master suite (combining two former secondary suites), and a sunny, light filled home office. Amenities include marble herringbone floors with checkered formal entry, custom painting, and designer touches throughout. The private grounds are designed for outdoor living and feature a large pool & spa, full barbecue center with bar and serving area, fire pit with seating, covered patio, and endless city lights and pastoral views." "Stunning Montecito Reserve- former Model Home behind the exclusive guard gated community of The Oaks of Calabasas. The estate is nestled on a prime view lot at the end of a cul-de-sac with the panoramic rolling hill views. The home offers 5 generous bedroom suites, 6 bathrooms, a Bonus+office room, dual staircase, and completed with luxurious upgrades and designer finishes throughout! Beveled edge Travertine floors, light hickory wood floors, lavish master suite features a romantic retreat with fireplace, massage and exercise room. This gourmet chefs kitchen offers a separate wine room, custom built-ins and Smart system. The backyard, a hosts' dream, with a cabana/guest suite, sunny courtyard, pavilion with fireplace and pool/spa. Blue Ribbon award winning Las Virgenes School District to complete the package." "Evoking a warm contemporary vibe, this Castille/John Laing Plan 3 model view home is custom in almost every way. Situated on a large flat lot, there is a spacious loggia/living room featuring a fireplace, TV, pizza oven and bathroom. There is an outdoor shower & spa facing the spectacular sunsets. Large grassy area & swimmers pool with fountains complete this perfect entertainer's yard. The family room has walnut flooring and a specially designed Macassar Ebony & stainless steel bar. The renovated open kitchen features quartz countertops & stainless appliances. A beautiful dining room & formal family room are adjacent. An 8-seat theater & office nook along with a guest bedroom with en-suite bath complete the first floor. Upstairs there is a large gym, huge enclosed office space and 4 additional bedrooms, all with en-suite baths. The master suite has incredible views and a beautiful master bath and professional his/hers closets." "Magnificent custom estate located along beautiful Malibu Canyon in Calabasas, designed by architect Les Makowski. The estate is on over 6 acres of beautifully landscaped property with breathtaking canyon views. The long private driveway leads to an expansive motor-court that can accommodate up 30 cars leading to a grand entry. Features include a gourmet kitchen, formal living and dining rooms, sound proofed studio/media room, family room, library and wet bar. The spacious and dramatic master suit has exposed beamed ceilings, balcony, gym, and a luxurious master bath. There are additional 3 large bedroom suites plus a separate guest/maids quarters. This entertainer's dream features a resort style pool and spa with caves and waterfall. This privately gated grounds provide ample privacy, rolling lawns, BBQ center and fireplace. Truly a spectacular house." "Breathtaking Unobstructed Panoramic city, mountain, and golf course views! Sited on over 35,000 square feet lot, prime top cul-de-sac location! No expense was spared with the high-end upgrades throughout the property! This 5 beds/ 5.5 baths house offers exquisite open floor plan featuring expansive chef s kitchen with new custom cabinetry and countertop, breakfast nook w/ French doors and double height formal dining room w/ expansive windows both open to upscale backyard. Large family room with grand windows set out to the scenic views. The 5-star master suite boasts large balcony overlooking endless views and upgraded master bath and large walk-in closet w/closet organizer. Four en-suite secondary bedrooms are exceptionally scaled. INCREDIBLE RESORT LIKE BACK YARD is complete with two fountains, beautiful terrace, outdoor fireplace, spacious bar area, large barbecue, pool & spa and gazebo." "This exceptional Mediterranean Villa is a rare opportunity to own a stunning home in the coveted & guard-gated community, 'The Oaks'. At 7,200 SF of living space, this luminous home features soaring ceilings & French doors throughout, all centered around a beautifully remodeled courtyard & fireplace. The Master Suite features a separate sitting room & balcony w views of the backyard & canyons, his&hers bathrooms, walk-in closet, & gym. W a total of 5 well-appointed en-suite bedrooms, add'l luxury living spaces include a screening room, formal dining, upstairs den, office, & openconcept living room wgourmet kitchen & breakfast area. The meticulously landscaped backyard boasts a grassy lawn, mature fruit trees, pool & spa w waterfalls &swim-up bar, kitchen,& entertaining areas. A rare feature to any home in The Oaks, the permitted guesthouse makes a perfect cabana room or space of your imagination & is a true entertainer's paradise in one of the most coveted neighborhoods in Calabasas."